Designing a custom coil cord is a breeze when you, and your wire and cable manufacturer are speaking the same language. When designing a custom coil cord, you have the opportunity to create a finished product that is perfectly matched to the needs of your equipment. But how do you know what information your wire and cable manufacturer needs to get started? Every coiled cord has three main sections—coil diameter, retracted and extended lengths, and tangents—you can use to clearly specify the physical shape of your cord. Understanding the specifications of these three sections and what they are can help you and your cable manufacturer stay on the same page during the design process. It may seem obvious, but the coiled section of a custom coil cord is its most important physical feature. Without the coil, it’s just a regular straight cord, so it’s important to make sure you clearly communicate what you need from the coils. One of the most important features to communicate is the coil diameter. By subtracting the diameter of the raw cable from the outside coil diameter, we get a mean diameter that represents the center line of the raw cable. This is important, because the larger a coil’s “circle” is the more raw cable is used. The retracted length of a custom coil cord is the measurement of the cord when it is not stretched. Most of the time, a cable manufacturer uses the retracted length as the primary way to specify how long the coiled section is. The extended length of a custom coil cord is how long it is when stretched to its maximum operational length. While this isn’t the primary measurement that is used to identify the coiled section of the cord, it is useful to understand how far the cord needs to extend. In some cases, however, the extended length is the primary consideration for the cord and should be clearly communicated. While the coiled part of the cord tends to get the most attention, the straight sections at each end (or tangents) are also key features that affect the overall function of the finished cord. There are two different types of tangents that are used on custom coil cords: axial and perpendicular. An axial tangent exits the coiled section of the cord along the center line, which allows them to stretch in line with the cable. Alternately, perpendicular tangents exit perpendicular to the coiled section, meaning they exit the final coil at a 90-degree angle. Coiled cords with this type of tangent are easier to manufacture, and are therefore more common. Working with an experienced wire and cable manufacturer is the best way to ensure your finished custom coil cord meets the needs of your equipment without busting your budget. You can get your projects started on the right foot by describing the basic cable you need with the coil diameter, retracted and extended lengths, and tangent type. 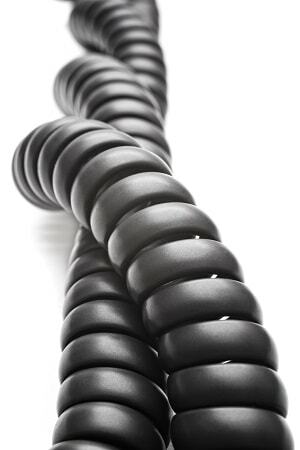 When you’re ready to talk about your next custom coil cord, get in touch with Meridian Cable. We are happy to answer all of your questions.